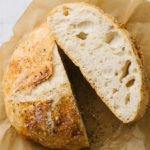 A simple homemade bread, no kneading and only 4 ingredients, that’s absolutely easy to make and so delicious! Recipe adapted from The New York Times. Takes about 5 minutes to prep, plus 14 to 20 hours rising. Mix: In a large bowl combine flour, yeast and salt. Add the water, and stir until blended; dough will be shaggy and sticky. 1st Rise: Cover bowl with plastic wrap. Let dough rest at least 12 hours, preferably about 18, at warm room temperature, about 70 degrees. Shape: Dough is ready when its surface is dotted with bubbles. Lightly flour a work surface and place dough on it. The easy way is to tilt the bowl and use a rubber spatula to scrap down the sides, turning the dough out onto the floured surface. Sprinkle the dough with a little more flour and fold it over on itself once or twice. Using just enough flour to keep dough from sticking to work surface or to your fingers, gently and quickly shape dough into a ball. 2nd Rise: Lightly sprinkle your parchment paper with flour, wheat bran or cornmeal, and put dough seam side down, dust lightly. Cover with a smooth cotton towel and let rise for 30 minutes – 2 hours. Bake: At least a 30 minutes before dough is ready, heat oven to 450 degrees. Place a 6 to 8-quart heavy covered pot (cast iron, enamel, Pyrex or ceramic) in the oven so it heats up nice and hot. When ready, carefully remove the pot, uncover, lift the edges of the parchment paper with dough and placed it straight in the pot. Cover with lid, place back in the oven and bake 30 minutes. Remove lid and bake another 15 to 30 minutes, until loaf is beautifully browned. Once done, carefully pull bread up using the edges of the parchment paper, let cook on wire rack.